"Astaxanthin has been referred to as nature's sunscreen, but it does a whole lot more to keep people looking good by promoting beauty and radiant health from the inside out. It improves fine lines and wrinkles, skin elasticity and moisture content while reducing inflammation and cell damage that leads to premature aging. Astaxanthin keeps people feeling good too. Recent research has documented its ability to increase cellular energy, protect against and treat cancer, protect against damage to the brain and nervous system, and halt the progression of complications from diabetes. In fact, astaxanthin may truly be considered a miracle nutrient." 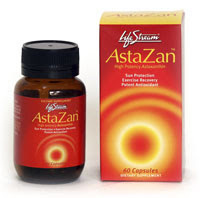 I have been experimenting with Lifestream Astazan since the beginning of the year to obtain some kind of practical handle on the quite amazing claims by manufacturers of products that contain astaxanthin and also by the research that has been published to date. Here is the page that outlines the product atributes of Lifestream Astazan. Sun Protection Over the late summer months while taking Lifestream Astazan daily, I was definitely able to use less sunscreen while running and cycling without suffering any sunburn. I can also report that my sun damaged skin has continue to improve since 2008 when I shifted my diet away from low fat to one relatively high in essential fatty acids. I feel that the astaxanthin has helped continue that trend to good skin health, despite advacning age. Over summer, I competed almost weekly in a 5km running race series. This gave me a testbed against which to assess any dietary changes. What I can report is a definite improvement in performance just one week into daily astaxanthin. What was most surprising was the sense of near instant recovery upon crossing the finish line, depsite sprinting to the finish. This was noted as well during two multisports races in which my brothers and I won the over 40's (We are all over 50yrs old btw), setting course records on both occasions. Astaxanthin has many health claims, including being beneficial for reducing skin ageing, redusing secondary damage associated with diabetes, reducing inflammation, boosting the inmmune system, fighting cancer, protecting the nervous system, overcoming chronic fatigue and depression and more. If you are seeking a boost in athletic performance or overcoming a chronic health issue, it may be well worth your while experimenting with astaxanthin.